RCB Awards has seen lots of unique crystal awards, but this project for ASQ (American Society for Quality), was a first for us. The customer wanted a crystal pen holder, two sided, with a greeting in braille. This was to be at the check in desk for a large meeting they were having. Since the etching process typically cuts into the crystal, this would leave recessed braille dots that would be too difficult for a finger touch to decipher. After much discussion over this with the customer, it was decided to break each of the designs in half, and the braille portion would be placed at the bottom and would be done as a reverse. This would etch away the background and leave the dots raised, and the text in the top portion would be done traditionally with the letters recessed. 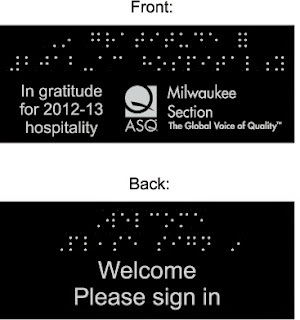 There is no braille translation of the ASQ logo, so that was not part of the braille portion. The actual piece turned out exactly as planned, with raised dots of braille for trained people to "read". Because the glass has a two sided etch, this photo does not do it justice, but you can see how the reverse portion on the bottom turned out, with the raised dots left un-etched while the background glass is removed. 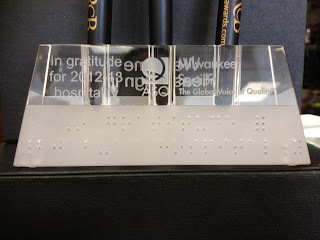 Matt Scholtes of Audio & Braille Literacy Enhancement, Inc of Milwaukee was instrumental in providing the information necessary for us to etch this project according to the braille standards. For more information on custom etching of crystal and unique crystal awards, contact RCB Awards. Fantasy Football Trophies are in demand from most league commissioners. These trophies are designed to hold a number of plates on each side of the base, allowing the winner each year to display his name. 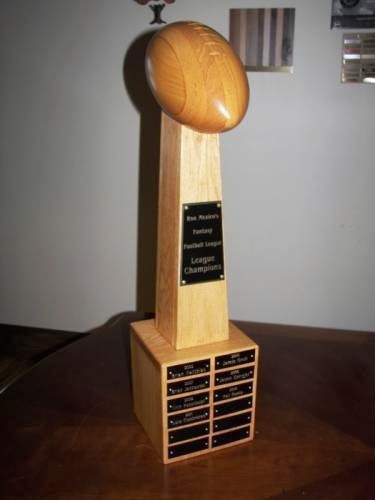 They can be inexpensive, as low as $85, or they can be similar to the big league trophy and cost several thousand. Typically, the commissioner unscrews a plate each year and sends it in to be engraved. 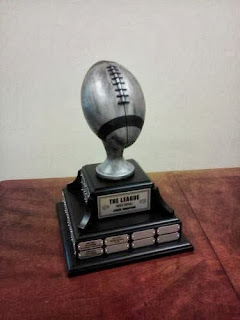 To see a selection, go to Fantasy Football Trophies. 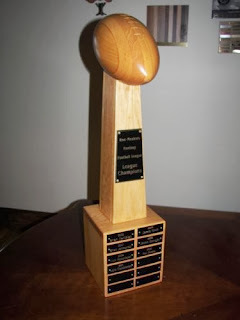 Many of the trophies made by RCB Awards are hand made, so you may need to allow extra time to have them made for you. 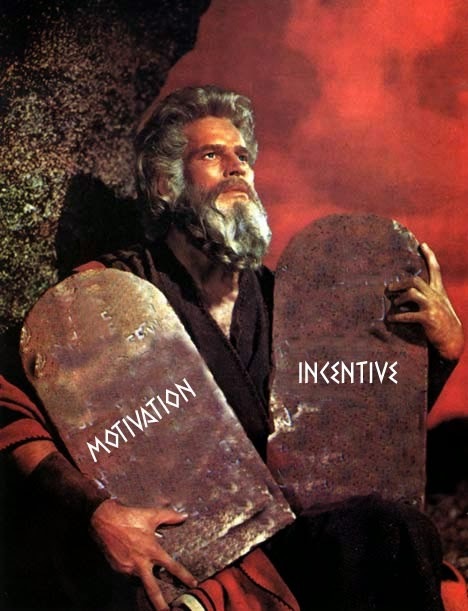 What is the difference between incentive and motivation? An incentive is often an external influence that persuades an individual to act in a certain manner. Sell more goods, get a bonus. This works often with cash bonuses, trips and valued items like an I-Pad. So what is motivation? Try looking at this as a psychological feature that drives one to act toward certain desired goals. It can be viewed as an internal driver that affects behavior. This is what really pushes someone to achieve great things. Internal motivation can be the strongest factor. Call it internal drive, a burning desire, focused, or any one of those descriptors, it boils down to a driving internal force that compels someone to act in a certain way, to achieve certain accomplishments. So where does recognition belong in this equation? The most successful awards are a combination of both. A symbolic plaque or freestanding award embraces the external aspect of incentive. As a constant reminder on your employees walls and desks, symbolic recognition is continually enticing them to perform or act in a certain way. Yet, physical awards move a step beyond incentive. When awards are symbolic, they last years after the gift cards, cash bonuses and trips are used. When this occurs, awards become motivation. A displayed award fuels an employee's pride and self worth, speaking to internal psychological senses that drive performance toward goals. It often serves to create office peer pressure, that gives motivation to others that didn't even receive the award. For more information, contact RCB Awards at 800-929-9110 or visit RCB Awards. Words have a powerful impact on a recognition presentation. Using the wrong words can often have devastating effects. Using the best words can have a tremendous positive influence. Practice is the best teacher, but perhaps here we can share some ideas. Results (result, resulting or similar) – “Your persistence in completing this project on time resulted in an immediate re-order by the customer!” You are demonstrating the correlation between action and the impact of that action. By showing this in a social recognition, peers get boosted by this and learn that their efforts also can be appreciated. You – Recognition experts describe this as THE most important word to use in a presentation. It makes the recognition personal and relevant, it gets people’s attention. It also forces you to be specific about what you are talking about. “You really did a fantastic job with the Johnson presentation”. Their Name – Scientific studies demonstrate that when you hear your name, your brain gets focused and attentive. Try to use their name at least 3 times in a recognition presentation. Even better when the name is in the middle of the sentence, as it is less likely to be glossed over. “The entire management team noticed what you did Sherry, and we are all very appreciative”. Because – This is one of those words that will have an important point following it, which gives it greater credibility and makes it more powerful. “Tina, because of the time you spent straightening out that situation, we were able to keep production going and didn’t lose any time”. What are some other impact words? These were presented by Darcy Jacobson at Globoforce. For more ideas, go to the RCB Awards Recognition Thesaurus and also check out the Award Text Suggestions - Plaque Wording - Crystal inscriptions. Posted by Curt Denevan: We've all heard the stories of a Sales Manager that doesn't believe in awards, that he just hands out cash as recognition for achievement. While there is considerable evidence to debunk this line of thinking, the below clip from Jerry Seinfeld says it better than any article out of the Harvard Business Review. Interactive Donor Walls bring a whole new dimension to donor recognition. With 25 menus that we can customize, video that is embedded, donor stories, Gifts in Action, Major Donor Profiles and annual donor lists, this dynamic and easy to update system allows the college to have a strong tool in cultivating donors. An interesting attractor loop runs when not in use, and serves to draw interest. Once the interactive screen is touched, it comes alive with the main menu. Working through the information, users find how philanthropy has been an important force, what has been accomplished with these major gifts, and how the college uses the funds. There is even a fun quiz about campus life! A tab for alumni highlights the importance of giving after students leave the college and enter the working world. The installation is in an old display case. The front is glass, with a film on the inside that is back lit allowing the campus scene to glow. It's pretty dramatic.